Heavy clay and variable to wet soils present a conundrum – while they often need the closest management, they are at the same time the most challenging to manage. 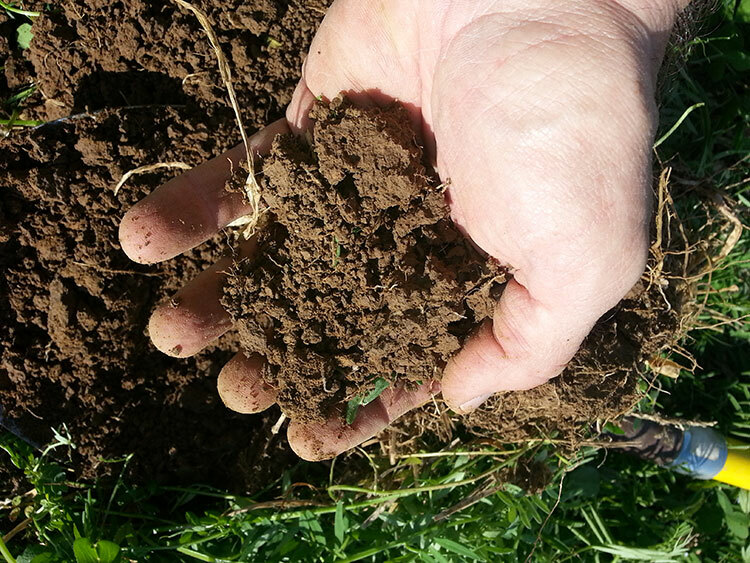 Establishing a crop in wet soils is difficult but all the more crucial, because building the health of heavier soils requires constant infusions of organic matter as well as living roots that can support soil life. Crops like corn are extremely reliant on mycorrhizal fungi for their roots to access soil nutrients, but beneficial soil organisms often have trouble establishing themselves in saturated soils. And soil structure definitely suffers in unplanted wet ground. The more you can build up structure and aggregation with diverse roots and soil organic matter, the more you can improve the drainage and carrying capacity of your heavy soil. What features allow a crop to survive wet conditions and heavy soils? Generally, a branching or laterally spreading plant and root structure that remains in the upper soil regions but can dig deep for moisture and nutrients if it has to. White clovers fall in this category, because they spread by stolons, branching stems along the soil surface. Others, like reed canarygrass or Kentucky bluegrass, spread to form a sod by branching rhizomes (laterally spreading underground shoots). Tap rooted species like alfalfas, red clovers, brassicas, and many other broadleaf crops are better adapted to droughty conditions or well-drained soils, although once established they can be very effective at uptaking excess moisture. If your soils allow you to establish them (barring fungal diseases, which may be more of a challenge for these crops), they’re also great for breaking through the compaction associated with heavy or waterlogged soils and creating drainage channels to improve infiltration. One trick is to look for some of the more branch rooted varieties out there – alfalfa in particular comes in some varieties that are branch rooted to tolerate wetter soils in addition to their taproot. In trying to reclaim heavier soils where you aren’t sure exactly what will survive, diversity is the best policy. More species means that at least a few are bound to stick. Also, many legumes have the potential to cause bloat in straight stands. Red clovers are often used as the next best stand-in for alfalfa when it comes to moderately wet soil conditions. Although not a first choice for poorly drained soils, red clovers are a good alternative to alfalfa that have better seedling vigor and competitiveness in the context of a mixed stand, and can tolerate lower fertility and more acidic, wetter conditions. They also have a lower degradable protein content than alfalfa, and maintain quality at harvest maturity, although they are known to be lower yielding and more difficult to dry for hay. Red clover can be overseeded into thinning alfalfa stands as a way to “stretch” the stand (alfalfa itself can’t be used like this because of alfalfa autotoxicity – existing alfalfa stands secrete chemicals that inhibit the germination of new alfalfa plants). Red clovers are also shade tolerant, which makes them a top candidate for frost-seeding, although white and alsike clovers are preferable in wet soil conditions. Milvus Red Clover is a rare red clover variety that spreads by stolons. Its shallower root system and spreading tendencies make it better suited to wet conditions and filling in gaps. Red, Alsike, and sweetclovers can tolerate a broad range of soil conditions. Alsike tolerates soils with variable drainage and is a particularly good legume for flood-prone areas or more acidic conditions. Neither a red nor a white clover, it has white flowers that turn light pink as they mature. Mix alsike with other clovers or cool season grasses as insurance. Note: Alsike is not recommended for horses. Intermediate and smaller white clovers have good capacity to withstand wet soils. Spreading by stolons, they find and fill in gaps, and are great for tolerating equipment traffic and grazing. Larger-leaved ladino types lack resilience in these conditions, however. Smaller and shorter white clovers are better in wetter conditions but also for handling hot, dry summers. White clovers establish a longer-term presence than most other clovers with their vigorous spreading activity, creating a more permanent stand, although individual plants may die off sooner – the smaller, low-growing crop is just better at pushing up new plants. Birdsfoot trefoil is a taproot legume like alfalfa, but with better tolerance to wet and acidic conditions. Its tannic acid content lowers its bloat risk, but it’s more difficult to establish and less productive than alfalfa. Reed canarygrass may be its best companion, as they tolerate similar soil conditions and similarly slow starting. Reed canarygrass is another wet soil go-to. Its use of rhizomes to spread helps it fill in sparse patches. An expensive seed and a slow starter, it will nevertheless persist and spread tenaciously once established. Manage it closely, since quality drops close to heading. Reserve reed canarygrass for areas where you want only reed canarygrass, since it has a tendency to aggressively take over once it gets going. Tall Fescue, though considered a bunch grass as opposed to a sod grass, can produce short rhizomes under close frequent grazing. Tall fescue is a workhorse grass that handles both droughty and wet soils. It can also produce more forage than other cool season grasses on soils with a more acidic pH (below 5.5). Because of its durability and wet soil tolerance, fescue is the staple species in many conservation mixes for waterways, bank stabilization, and marginal soil reclamation. It’s also a top choice for mixes that take a beating, such as turfgrass mixes or exercise lots. Although traditional tall fescues are the hardiest, the toxic endophyte harms animal health and productivity. Choose improved, soft-leaf, endophyte-free or beneficial endophyte varieties for forage. Kentucky bluegrass is a short, densely growing sod grass that spreads by short rhizomes, and is generally considered the top species for close grazing, especially with horses. Festuloliums are man-made crosses between a fescue (meadow fescue or tall fescue) and a ryegrass, with the objective of combining the winter-hardiness of fescues with the quality of ryegrass. Ryegrasses have moderate moisture tolerance. They do better in cool, moist soil than hot, dry conditions, and need to be carefully managed in terms of grazing or cutting height and rotation schedule to preserve their presence in the stand. Timothy is shallow-rooted and can tolerate moist soils, but is best on soils that may be wet for a brief time and then dry out. Timothy has high productivity in spring, which drops off in summer and fall. It will not be highly competitive with legumes in a mix. Meadow Fescue tolerates wet soils but not flooding. It is more winter hardy than tall fescue, but tends to be more negatively impacted than other species by drought. Meadow fescue is best for cooler and more northern regions. Although all summer annuals love hot, dry weather, millet is the one to best handle any wetter and more acidic conditions. It will also have improved regrowth in the face of moisture-related disease pressure. Your initial efforts on wet ground may not be perfect, but if you prioritize getting something planted, you can count on roots and other residue to stimulate soil microbes, and leave channels in the ground to eventually absorb more moisture. by Genevieve Slocum, King’s AgriSeeds Inc.